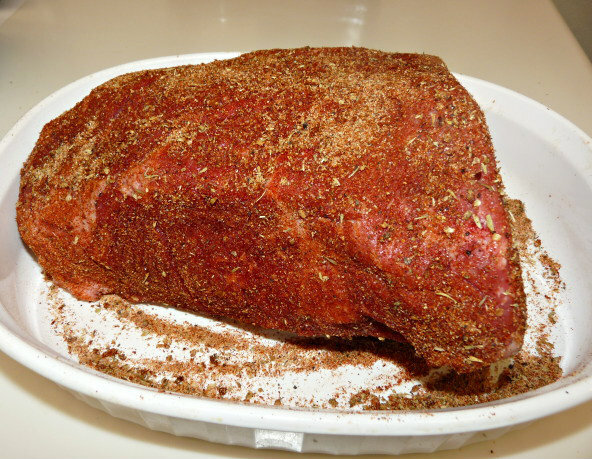 The star of the show – a 4lb beef round roast. Having never done one before, and knowing that I couldn’t duplicate exactly what I saw on the videos, I turned to the guys at The Egghead Forum. I knew that if anybody knew how to do one on the Egg, these would be the guys and they did not disappoint. I got plenty of tips and pointers. I finally settled on Steven Raichlen’s recipe that was published by the New York Times HERE. 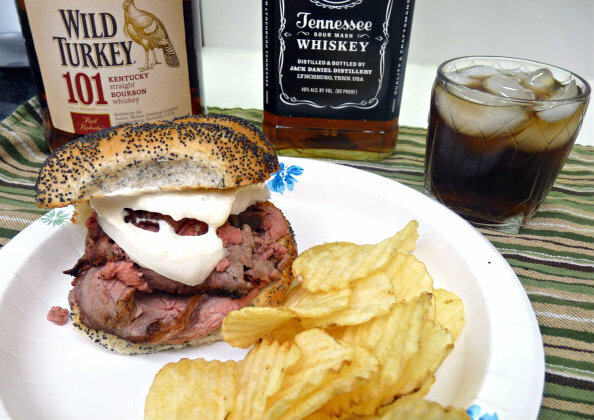 While normally pit beef is made from top round roast, I was told bottom round and eye of round would work as well. Someday, I am actually going to become better organized and plan ahead. 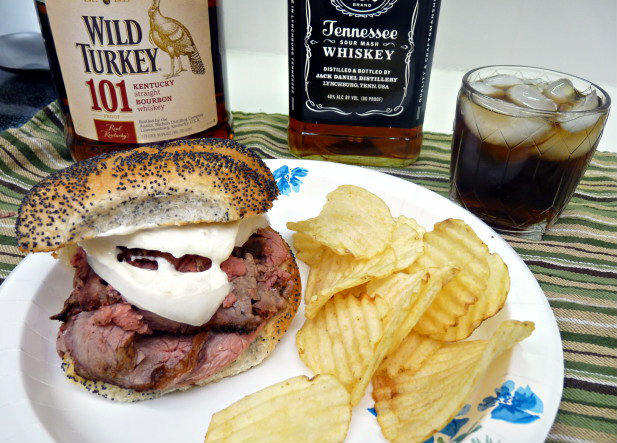 When I went to the grocery store, the only top round they had was sliced for London Broil. I figured that was not going to work and after talking to the butcher and discussing what I was going to do, he suggested this beef round roast. I use this cast iron bacon press to hold odd shaped meats up so that I can get a sear on all sides. Remove meat from the refrigerator about an hour before you plan on cooking and allow to begin to come to room temperature. Preheat your grill to 450F. If using a grill other than a Kamado style grill, set it up with a direct and indirect zone. Sear your beef on all sides. I did mine for about 6 minutes a side taking about 30 minutes total. Remove beef from the grill. 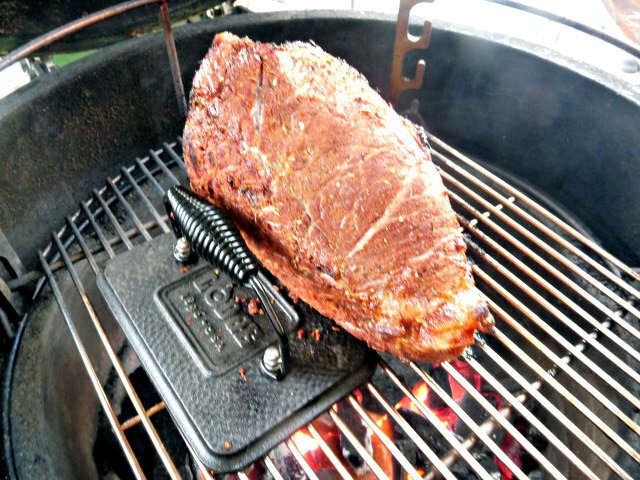 If using a Kamado style grill, set it up for an indirect cook at this point and return beef to grill. If using another types of grill, move the meat to the indirect heat portion of the grill. Continue cooking until you reach an internal temp of 120 for rare and 125 for medium rare. You do not want to take it past this point or it will be tough. 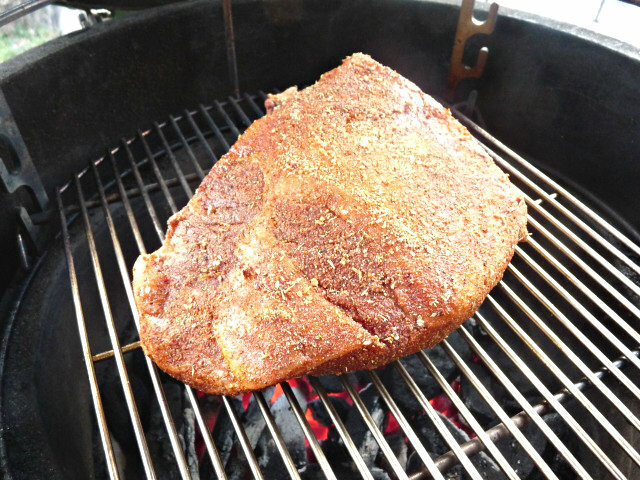 This will take approximately another 30 minutes or so, give or take depending on the size of your cut of beef. Slice beef as thinly as you can across the grain. A good, sharp knife works well, but an electric slicer would be better. Pile beef high on a roll slathered with Tiger Sauce and top with raw onions. You can top with lettuce and tomatoes is desired. If you watched the videos of Chaps, you will notice we didn’t follow their method exactly. They cook the beef over direct the whole time. 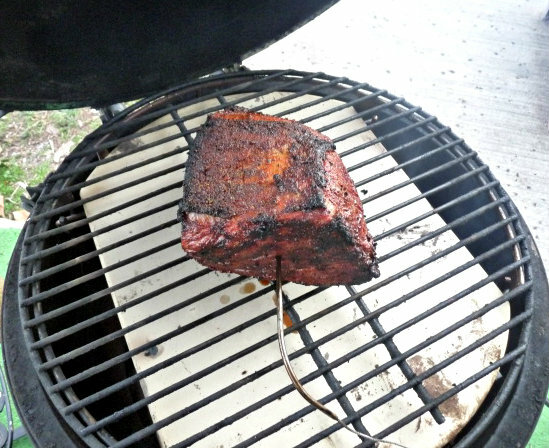 You can try this method if you want, but you will be manning the grill the entire time. By searing and then moving to an indirect cook, you give yourself a bit of a break and can sit back and relax while the beef is finishing up. Had to take just a bit while it was resting. You know…quality control and all that. Breaking out the meat slicer that I got for Christmas. You do have a meat slicer, right? The meat slicer worked great and made quick work of the beef. While not as heavy duty or as fast as the ones you would find in a deli, this one will work pretty good for home use. Just don’t rush it and force the meat. 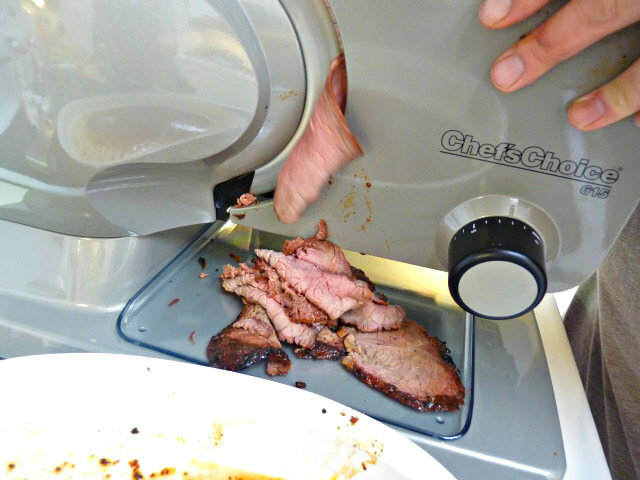 Allow the slicer to do the work for you. Will you look at that? What a beautiful site! 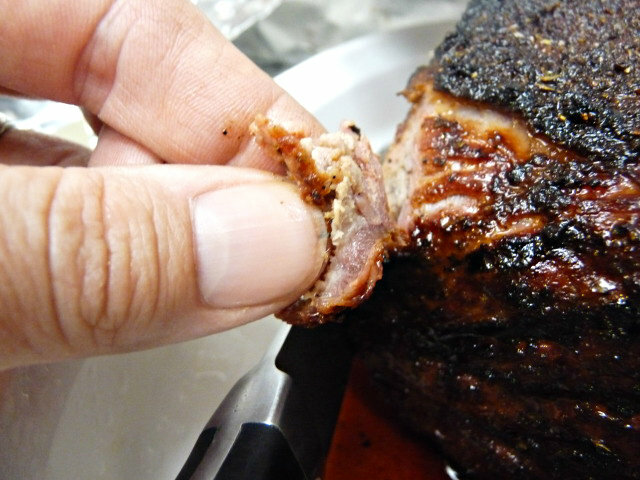 A pile of meaty goodness, nice and pink and tender. We ate ours just as they serve them at Chaps (I’m assuming), meat piled high, topped with a thinly sliced raw onion and the Tiger Sauce. Truth be told, I totally forgot about getting the lettuce out and slicing the tomatoes. Honestly, this sandwich doesn’t need it. The sharp, pungent flavor of the onion and the creaminess (yeah, I know, that’s not a word, but it should be) and heat from the Tiger Sauce paired perfectly with the beef. Slicing the beef thinly transformed what can often be a tough, lean cut of beef into a tender cut. Overall, a great sandwich and one we will be doing again. While it isn’t traditional BBQ, what with it being grilled directly and the lack of any smoke used, it is down right good eats. Dang man, you do good stuff! Thank you, kind Sir. Right back at ya. Looks really nice. 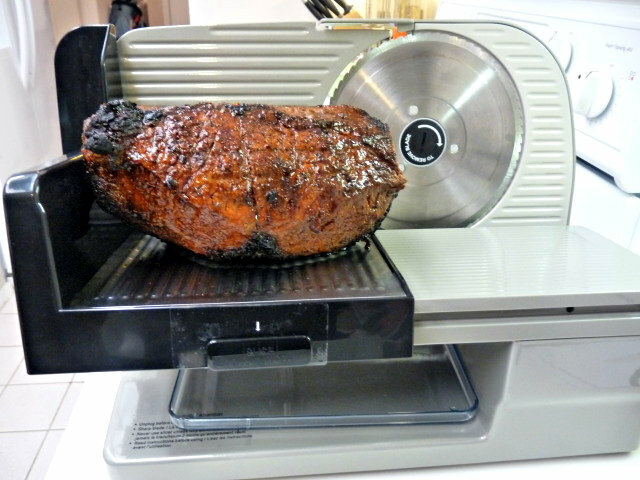 What do you think of your slicer? I might be in the market for one in the next few months and am looking for recommendations. — By the way, ‘creaminess’ is a word. It is? Crap. Oh well. It worked pretty good. It’s not the best in the world, obviously, but for home use, I think its fine. Just take your time and let the blade do the work, don’t force the meat through. Its the Chef Choice 615. Think it was around $150, at least that’s what Amazon has it for now. LOL, it was on my wish list for quite awhile. Ever since I did some pastrami and couldn’t slice it thin enough. 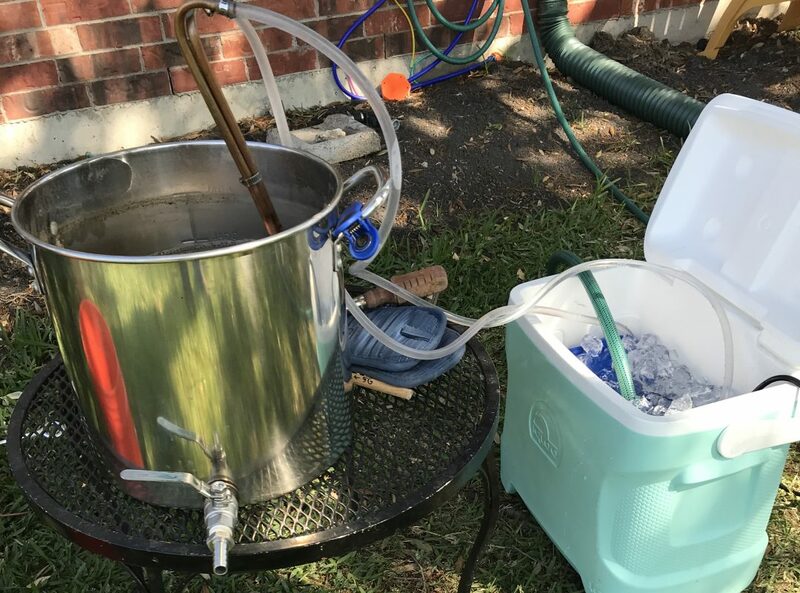 Speaking of, I think we’ll be doing that next weekend. Had to do a double take,that first picture looks like a big ol’ slab of Brie on the sandwich! That was a picture taken out at our ranch. I went to BU. The in-laws went to UT and A&M. Kind of a house really divided. 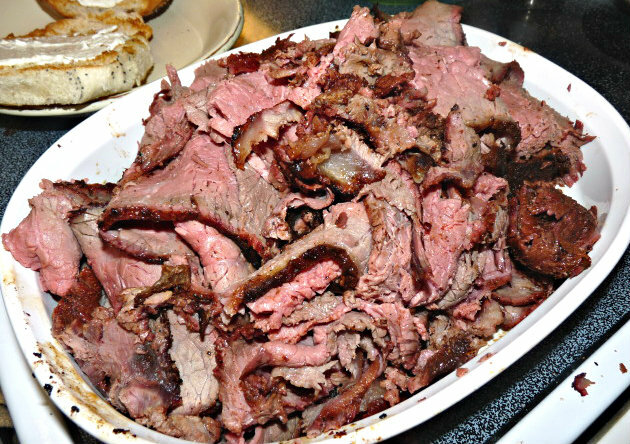 I made pit beef with eye of round and I don’t think it was any better than yours. It looks great, Jason! Thanks, Chris. It was pretty tasty. I think next time, I’ll slice it in half and freeze one for later. Or have people over to enjoy it. Now I’m ready for lunch. Wow, the meat is perfectly cooked. Every step looks perfect. I’m glad your cut of beef worked out, even if it’s not what you wanted exactly. It’s amazing. When you switched over to indirect what temp did you set your kamado to ? I kept it at 450F for the whole cook as far as I can remember. At least that is what it says in the picture. I just switched to indirect to protect it from the flames.